“October 31st and November 1st will remain for ever memorable in the history of our country, for, during those two days, no more than one thin and straggling line of tired-out British soldiers stood between the Empire and its practical ruin as an independent first-class Power.” (John French, 1914). 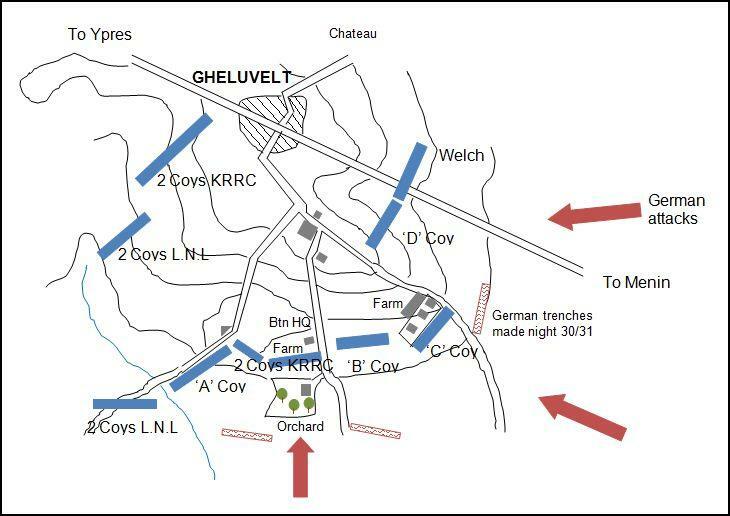 The 31st October 1914 saw the Battle of Gheluvelt, one of the battles of First Ypres. Well known for the actions of the 2nd Worcesters, who retook the chateau and the village after they had been captured by the Germans, several other battalions were also involved, including the 1st Battalion The Queen’s (Royal West Surrey Regiment). The importance of Gheluvelt was paramount. Sitting on a ridge the Menin Road, it was the last bastion of defence before Ypres. If the Germans broke through here, they could take Ypres and move on to the channel ports. The 1st Queens had landed at Le Havre on 13th August. As part of the 3rd Brigade, 1st Division, they had seen plenty of action, most recently on 23rd October near Langemarck. Casualties that day were 17 killed, 39 wounded, and 89 missing. In total, since landing in France, the battalion had suffered 58 killed, 264 wounded, and over 130 missing. Casualties among the officers were particularly high, with 24 killed and wounded by 29th October. On that day the battalion moved into trenches east of Gheluvelt, two further officers becoming casualties. The following day was fairly quiet, although the line was shelled throughout the day. At 7pm an attack on ‘C’ Company was repulsed, although sniping continued throughout the night. The morning of the 31st October opened with a pre-dawn attack towards the two farms held by the Queen’s. The Germans were unsuccessful, however shelling continued throughout the morning. In a second attack the Germans managed to take the Orchard, driving out one platoon of the 1st Queens and one of the 2nd KRRC. A counter-attack was ordered by the commanding officer of the Queen’s, Lieutenant-Colonel Pell, but an attempt by the KRRC failed. 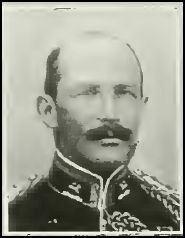 Major Watson went back to seek assistance and on his return found Lieutenant-Colonel Pell had been wounded; hit in the leg, which had been broken. Major Watson assumed command. By 10am ‘B’ Company had been driven from their line by heavy machine gun flanking fire. By 11am both ‘B’ and ‘C’ companies were retiring. ‘D’ Company were given the order to retire but it soon became apparent that Gheluvelt itself had been taken and the Germans were moving in behind them. Major Watson and Second Lieutenant Boyd tried to reorganise the remaining troops around the junction south of Gheluvelt, holding the area for the remainder of the day. In the meantime the 2nd Division had been brought up, and retook Gheluvelt in the afternoon. This is when the 2nd Worcesters carried out their famous bayonet charge, linking up with the remains of the 1st South Wales Borderers and driving the Germans out of the chateau and the village. The threat to the British line had been averted at the last minute. The following day, only 32 men from the 1st Queen’s could be accounted for. ‘A’ Company had 24 men remaining; ‘B’ Company four; ‘C’ and ‘D’ Companies just two men each. Major Watson and Lieutenant Boyd were the only officers who had come through unscathed. The battalion, consolidated with remnants of the other battalions who had fought in the action, remained in the line until 8th November. In total nine officers and 624 other ranks had been killed, wounded, or were missing. They included Lieutenant-Colonel B.T. Pell, DSO, the battalion’s commanding officer; unable to move due to his broken leg and the heavy shellfire, he was in the farm with the Medical Officer when it was rushed by the Germans. He would die as a prisoner of war on 4th November. The CWGC database records 180 deaths in the battalion during this period. Of these, over 75% have no known grave and are commemorated on the Menin Gate memorial. This entry was posted in Surrey Regiments, WW1 and tagged 1914, Gheluvelt, Queens, Surrey, WW1. Bookmark the permalink. Do nominal rolls exist for the Company’s of 1 Queen’s? My Grandfather, Pte Louis Philip Mann took part in this battle and sadly, his Army record did not survive the WW2 German bombing, so it would be fantastic to find out anything further. Hi Phil – Louis went overseas on 19th September 1914 and joined the battalion shortly after. After being wounded he was admitted to hospital on 7th November, having arrived on the Hospital Ship Oxfordshire a few days before. His injuries were:Bullet Wound Right Hip and Shrapnel wound in the left Buttock. Do you happen to have a picture of him? Many thanks for the above information, which adds a few more pieces to the family history puzzle. It would be great to find out which Company he was with to gauge his position during the battle but I know records were scant and I believe I read somewhere that the original War Diary was damaged during the battle, so nominal rolls probably went the same way. I can send a photo of him in the 1920’s and provide any other information that you think may be useful if you have an email address I can forward them?